Just when we got used to seeing author images in search results on Google, the search engine behemoth goes and removes them. Why? Well, according to John Mueller, a Webmaster Trends Analyst with Google, the removal was implemented in a response to poor click-through rates. It seems that while Google believed their new, image-rich format would improve the performance of search results, the difference was negligible. So they have reverted back to what Mr. Mueller calls a "less-cluttered design." Danielle's pretty face is absent, as is her Google+ circle information. 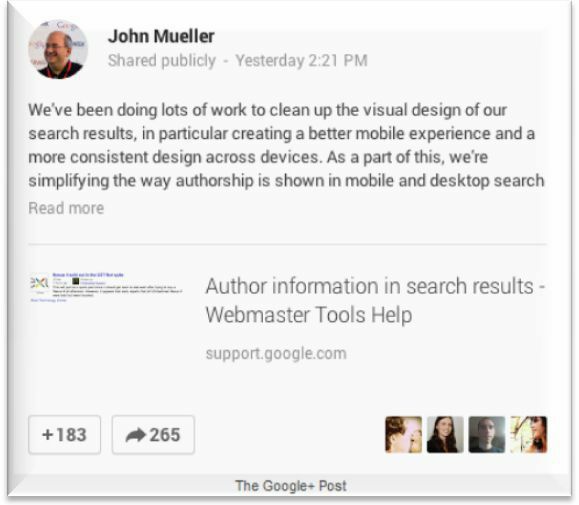 Google hopes this will de-clutter search results and lead to a better user experience. We will see! I believe that authorship (image or not) will continue to be important. So, just because Google decided to ditch your headshot, don't think that authorship is no longer important. I feel that authorship will most definitely be used as a ranking factor. So if you claim your authorship, or continue to do so, you will remain ahead of the curve. Also, even if your picture never pops back up, your name will still appear in search results, which not only gives you a slight advantage in click-through-rate, but builds your good name, and thereby your brand. If you've not yet claimed authorship, do not let these changes discourage you from doing so. Follow our step-by-step directions found here, on page eight of our Google Local Webinar. Evidence that the click-through-rate on search results is the same without images, as Google asserts. Indications as to how results with a video (right now, the still image from video results is still displayed in search results) are performing. It is possible that they will perform better now that authorship images are gone. Any and all changes to the way search results are displayed. If there is one constant with Google, it's that nothing is constant. To keep abreast of the SEO news you need, be sure to like us on Facebook or sign up for our snail mail or e-newsletter, or both! And as always, we'd love to hear from you, so call 888-886-0939 to speak with a member of our U.S.-based SEO and small business marketing team.